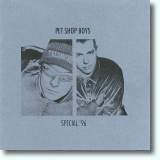 In addition to standard albums, album "special editions," singles, and remixes, the Pet Shop Boys have occasionally released limited-edition "mini-albums" or promos that are harder to categorize but which nevertheless deserve separate mention. I list some of the more notable such releases here, but this list is by not by any means intended to be comprehensive. 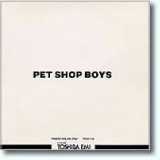 This vinyl disc was apparently the first of what would become a string of Japanese-only EMI releases intented to promote new Pet Shop Boys albums by mixing some of their latest tracks with key selections of their previous work. In this case the new album Actually was meant as the primary beneficiary. Side 1 offered new songs from that album, while Side 2 presented popular tracks from the preceding studio album, Please. It's been called "the Holy Grail of PSB collecting": an extremely rare set of three plain white-label seven-inch vinyl discs (with absolutely no printing, not even the track names, on the labels or sleeves) released to a few select U.S. radio stations by EMI America to promote Introspective. Each side features one of the six tracks from the album, only they were all unique "radio edits" ranging in length from just under four to just over four-and-a-half minutes. No one seems to know exactly how many copies were produced and distributed, but it wasn't very many. Genuine copies have fetched prices of more than $900 (or about £750, €860, or ¥105,000). Not surprisingly, it's been bootlegged, sometimes in more elaborate packaging but at other times in white-label vinyl replicates that are all but impossible to tell from the real deal—which only adds to its mystique. The black-and-white artwork of this Japanese promo is clearly meant to parallel the concurrent Introspective album. The track lineup, oddly enough, combines all of the songs from that album—the only difference being that "Domino Dancing" appears in its single version as opposed to the extended album version—with several tracks from Please and Actually. 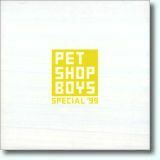 This special, limited-edition mini-album was released only in Japan to coincide with the Pet Shop Boys' first tour there. It combines the seven-inch mixes of several of their more recent singles of the period—which otherwise weren't yet available on an "official" album—with a couple of the corresponding b-sides. As an interesting (and highly collectible) bonus, it came packaged with a phone card bearing the image of the CD's cover art. Through the years this has proven to be one of the most highly sought-after PSB special releases, probably on account of that very cover. An extremely rare Toshiba-EMI Japanese-only promo of which it is believed that only about 50 copies were made. Distributed to select radio DJs and critics to promote the most recent album Behaviour, it features all of that album's tracks plus several of the Boys' previous hits. ZYX, a German label that at the time specialized in international dance music (but has since branched out), obtained the rights in the 1990s to issue some of the very earliest PSB material recorded in late 1983 in New York City with Bobby 'O' Orlando. 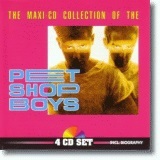 This material was assembled onto four CDs—despite the fact that it would easily have all fit onto just one, indicative of the highly exploitive nature of this collection—and saw widespread release as The Maxi-CD Collection of the Pet Shop Boys, though often referred to as "ZYX Maxi" for short. The music is comparatively unsophisticated and underproduced, but it ably demonstrates how the Boys sounded during this embryonic period. From this writer's perspective, it's primarily of historical interest—but extremely interesting from that limited perspective. 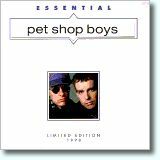 It is, however, one of the few places where you can find one of the most obscure tracks in the Boys' entire body of work: the eponymous near-instrumental "Pet Shop Boys." A Japanese promo that combines a couple of Bilingual singles with a "best-of" selection. Not only does it have curiously unattractive artwork (practically screaming "rush job"), but it just as curiously starts and ends with the same song. Two different mixes? More than likely, though at this point I don't know that for a fact. 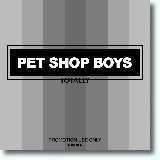 Originally recorded as a two-part BBC Radio One documentary detailing the history and work of the Pet Shop Boys, About—or, if one prefers to deviate from the one-word-title trope, About Pet Shop Boys—shortly afterward saw life as a two-disc exclusive PSB Fan Club release. Created by the Boys' official "Boswell" Chris Heath along with Radio One's Lucy Armitage, it provides a wealth of material stemming from interviews with Neil and Chris (often quite amusing, showcasing their humor) as well as assorted others involved at various points of their career. Most tantalizing of all are several brief excerpts of rare and/or unreleased tracks, such as "Fat Northern Bastards" and their early "Six Free Stickers" promo for Smash Hits magazine. An unfortunate downside is that each of the two CDs consists of single unbroken track with no numbered divisions, which makes it a somewhat inconvenient listening experience. Nevertheless, it's greatly treasured among dedicated fans as a highly collectible rarity. 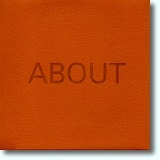 A limited-edition CDpart of EMI's "Collector's Series"that was formally released only in the United States and Japan. It consists entirely of previously released material, songs from the period of Please through Behaviour, although some are remixes previously unavailable on compact disc. Now out of print, it's becoming increasingly hard to find. Whether it is indeed "essential" could be a matter of debate among most fans. But, at least among full-fledged completists, it undoubtedly is. 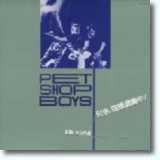 This EMI Japanese promo is a two-CD set with 33 tracks—a comprehensive retrospective of PSB hit singles up to that point—designed to support the Nightlife album and promote the current single "New York City Boy." 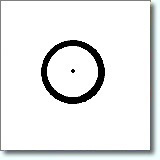 (It offers not one but two versions of that song, each the first track of its respective disc.) In many ways it's an anticipation of their PopArt collection still a few years down the road, missing several songs from that subsequent release but also including a couple that the later anthology would lack. No doubt—if only for its odd size and shape—one of the most unusual PSB special releases, this three-inch CD-ROM was issued exclusively to concert-goers for the U.S. leg of their Nightlife Tour in October and November 1999. Upon insertion into your computer's CD-drive, it provided a navigable simulated "Times Square night scene" (inspired by "New York City Boy"), excerpts from the Nightlife album, tour information, website links, and a screensaver, among other goodies. It came in a clear plastic credit card-sized holder. Presentation of this item at a Tower Records store (a major U.S. retail chain that has now, most regrettably, gone defunct) would grant you a specially reduced sale price on the album. Then again, I would imagine that the majority of people who had shelled out the price of the concert tickets had already bought the album well beforehand. Yet another Japan-only Toshiba-EMI release: an unusual mini-album compilation of one Nightlife album track, recent single b-sides, live tracks, and an extended dance mix. 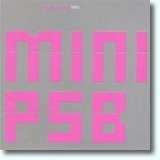 The minimalistic hot-pink-on-gray cover art, which employs the "Nightlife font," is particularly striking. Unlike the previous Japanese special releases, however, this collection received fairly widespread general distribution in music shops around the world, making it considerably less rare than most of the other releases described on this page. A promo disc distributed with copies of the May 12, 2001 issue of The Daily Telegraph newspaper of London. 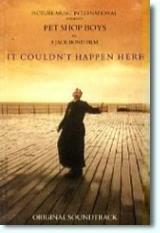 It consists of Pet Shop Boys recordings of several songs from their musical Closer to Heaven, which would open at London's Arts Theatre later that same week. The "Slow Version" of "Closer to Heaven" and "Friendly Fire" were seeing their first release, but "Shameless" and the other version of "Closer to Heaven" had previously appeared as a single b-side (and later on Alternative) and on Nightlife, respectively. 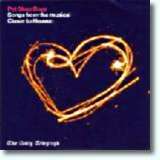 Released as a promo in Europe to generate interest in the 2001 reissues of the first six PSB studio albums, this remarkable disc gathers a few lesser-known songs with some of the more theretofore hard-to-find tracks (mostly obscure mixes) that in several cases made their CD debuts on the reissues' Further Listening bonus discs. An extremely enticing collection indeed, one that was sure to get fans and collectors alike salivating in anticipation. And isn't that precisely what a good promo is supposed to do? 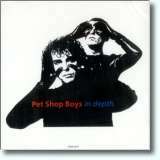 Another promo for the 2001 reissues, this one was released exclusively (as far as I know) on vinyl by EMI France. Seeing as how it consists of two twelve-inch discs, and most of its tracks are extended dance mixes, it was almost certainly geared toward the dance-DJ market. 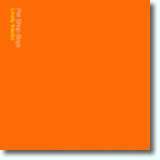 The simple bright-orange packaging is surely meant to evoke Very—regarded by some as the pinnacle of the Boys' tremendous success in the field of dance music. This promo was distributed with copies of the March 8, 2009 issue of The Mail on Sunday edition of the London Daily Mail. Designed both to promote the soon-to-be-released album Yes and to commmemorate the Boys' receiving the "Outstanding Contribution to Music" Award from BPI, it caused controversy among some fans on account of the Daily Mail being widely considered a right-wing, anti-gay publication. 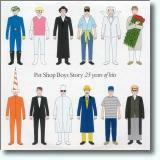 Many other fans, however, are extremely fond of it by virtue of its delightful Mark Farrow cover art, which depicts various PSB "looks" spanning their career in the form of cute paper doll-like figures of Chris and Neil. The disc itself serves as a handy (if inescapably gap-filled) single-disc career retrospective with the distinction of its tracks appearing in chronological order—with a bit of a hedge there on "Jealousy" and "Being Boring." Released exclusively in Brazil for the holiday market in November 2009, Party is a single-disc greatest hits collection that focuses on tracks that have proven especially popular in that nation. It also gives a nod to songs that have featured in certain Brazilian telenovelas, the most recent example being "King of Rome." Although the tracklist reveals more than a passing similarity to Story, it's by no means completely redundant. Besides, it boasts another absolutely charming PSB cover—that's two in a row!—what with those colorful balloons printed with Chris's and Neil's heads. *These errors were, according to the Pet Shop Boys themselves, the result of EMI employing the wrong recordings, different from those that the Boys had submitted as their own desired track-listing. 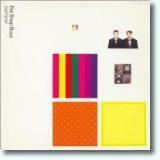 For example, Neil and Chris had wanted the "10-inch mix" of "West End Girls" to appear on Party, but EMI used the single mix instead. This special holiday package was released in mid-December 2009. It likely arose from the expressed desire of Neil and Chris for "All Over the World" to be released as a single, perhaps contrary to the wishes of their record company, with this "EP" (as it's officially termed) emerging as a compromise. Whatever its genesis, it proved a treat for fans. Even the songs that had been previously released by the Boys appear here in brand new versions. Both "It Doesn't Often Snow at Christmas" and "All Over the World" are new versions co-produced by the Boys with Marius de Vries, and the "Viva la Vida"/"Domino Dancing" medley (familiar to those who attended the Pandemonium Tour shows) was produced by Stuart Price. 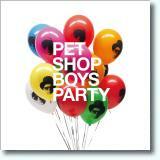 The EP's cover art employs the same balloons that graced the Party cover, only now given their freedom, so to speak. It's also worth noting that this EP has the distinction of being the only one of the "special releases" cited on this page to hit the U.K. singles chart, where it registered at #40. 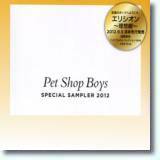 Yet another in that series of PSB EMI sampler CDs issued only in Japan. This one starts off with the first two singles from Elysium and then dashes through the Boys' career beforehand, offering at least one single (occasionally two) from each of their preceding studio albums, and even tossing in one of the new singles from PopArt for good measure. The inclusion of this compilation here is somewhat questionable considering that it has had no physical release nor even any conventional "digital download" option. 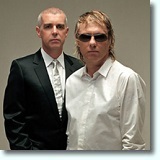 Rather, Chris and Neil compiled it themselves (a highly salient fact that, more than anything else, earns it a place here) as a special Spotify playlist, presented to encourage listeners to "discover a whole new side to Pet Shop Boys." But perhaps, as of 2016, this is what has come to constitute a promo compilation. And it's certainly an extremely interesting collection. Indeed, it's one that, if not actually calculated to win them new fans—and additional respect as songwriters—may nevertheless have that benefit. 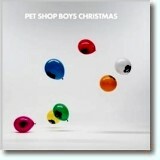 The Pet Shop Boys have one with this release—an agenda, that is—and it's sociopolitical commentary. 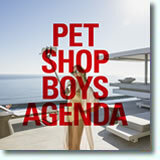 Unexpectedly announced on February 5, 2019—the same day on which the first of its four socially conscious tracks became available on streaming services (followed by one more track per day for the next three days)—Agenda is a good old-fashioned EP described by the Boys as consisting of three "satirical" songs and one that's "rather sad." It's scheduled for physical release in two formats: a CD available excuslively as a bonus with the mid-April release of their official publication Annually 2019, and a 12-inch vinyl disc slated to go on sale around the same time. Its songs are co-produced by the Boys with Tim Powell (who had previously co-produced "Together" and "Glad All Over" with them) and will not appear on their next studio album, which will be produced by Stuart Price and is scheduled for release in Autumn 2019.